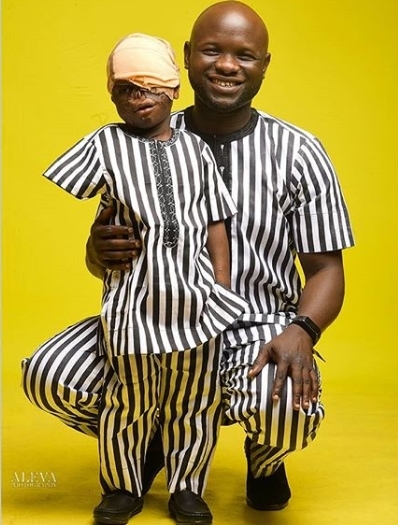 The heartbreaking story of a young boy who survived a tragic fire accident after loosing his sight and hand, has been narrated online by a humanitarian who adopted him. 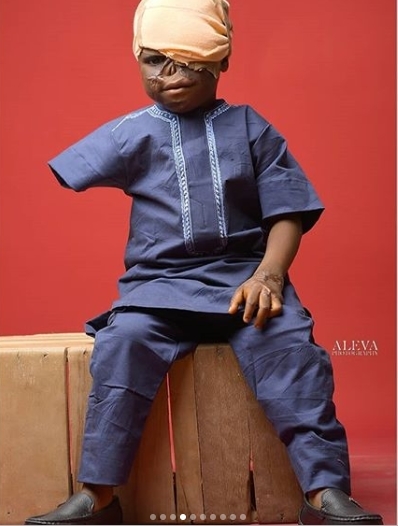 Life may have thrown a huge curve ball at Fanen Terhemen, but this little boy has proven to not only be a fighter but a survivor who's going to keep living despite his scars. Having suffered a third degree burn when he got involved in a fire accident, his survival story has melted many hearts on social media. The little boy lost his hand in the fire which left his face heavily scarred leading to loss of sight. 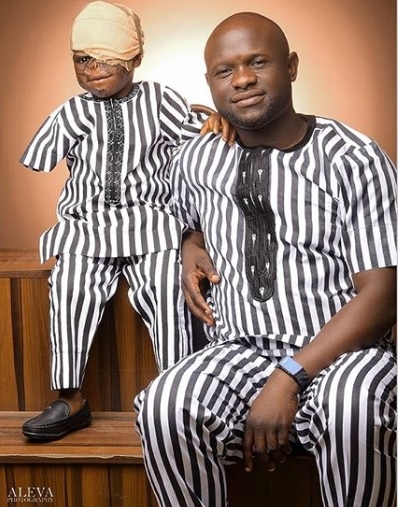 According to reports, the father of the little boy was on the verge of relocating to the village to face their fate after they were forced to leave the hospital due to their inability to foot the medical bills. However, a humanitarian identified as Ukan Kurugh got wind of their situation in September 2017 and called on well meaning Nigerians to help. 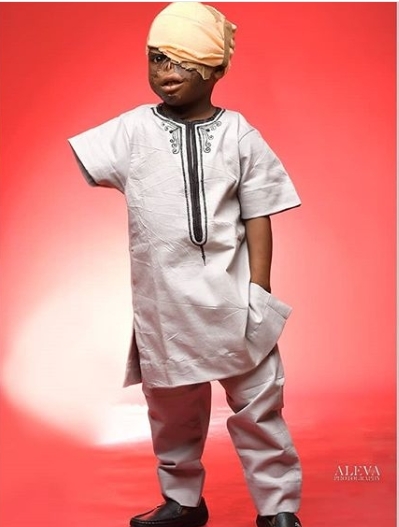 Through the donations from several people, the boy was able to undergo surgery. 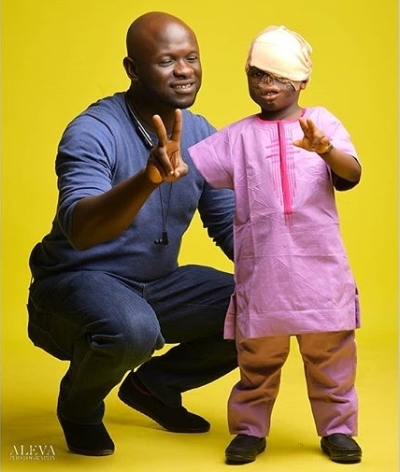 So far, he has undergone 6 surgeries on his hand and face and this was made possible with the N2m donations sent in by Good Samaritans. Now recuperating from the surgeries, it appears little Fanen is in good spirits, judging from the new photos that surfaced online. "A YEAR THROUGH MEDICATION AND THE POSITIVE IMPACT OF THE NEW MEDIA: FANEN TERHEMEN IN PERSPECTIVE. On or about the 20th day of September, 2017 at the Kings Park Polyclinic, Makurdi, I was introduced to a man and his dying son who suffered third degree burns; a condition that took off his right hand leaving the two bones on the hand protruding from his wrist. He was defaced by the tragedy and was obviously in unimaginable pains. They were all packed and ready to leave back to the village in Ushongo. That was Fanen and his father, Mr. Terhemen. I was briefed of the incident by his father who was almost putting forth tears. He explained how a hospital in Wadata had sucked them dry of the little they had before forcing them out. He lamented how hopeless their condition was and that he had made up his mind to return home; orchestrated mainly on the absence of cash. I was accompanied by my friend, Barr Raphael Ashwe. I saw a dying boy and was moved with pity. It was obvious they had given to fate and it was clear, the boy wasn&#39;t going to make it if they went away. With my tablet and wireless modem, I started ingloriously. I wasn't sure if my efforts would even help, but I just knew that, I needed to start. Look where we&#39;ve arrived today. Fanen, I believe is a child of destiny. 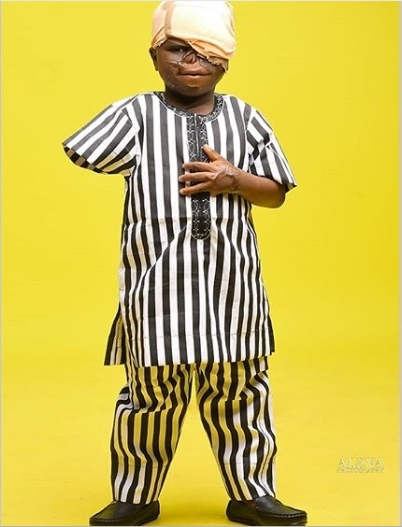 Over 2 million naira has been spent to preserve his life and to get him healthy. Across the globe, good spirited individuals rose up to the responsibility and made their contributions towards his treatment. He has undergone about 6 surgeries on his hand and face and the difference is clear. A man called me and said, I'll love to give u money for Fanen operation but watching his video and seeing the pictures, he will not make it alive but God proved him wrong and here is the young boy of 4years who has not only come out of the condition but far better off with one more surgery to go which is reconstruction of the nose, which by his grace will be carried out on him February 2019. I cannot thank you all well enough. You stood by me through one year and 3 months to save a boy. The walk hasn&#39;t been easy but the impact has been massive. I appreciate God Most High."